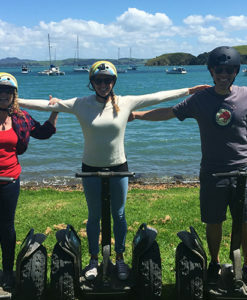 The Bay to Beach tour starts off with some basic training and gliding around on the grass at Matiatia Bay to get to grips with the Segways. 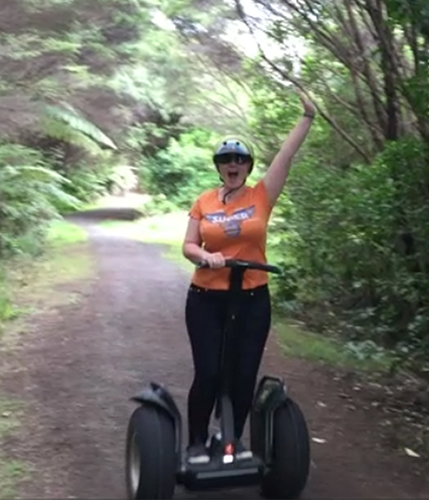 Once everyone is feeling confident with their new skills we head into the bush to wind our way through native trees, Flax plants and shaded areas covered with the famous New Zealand ferns. 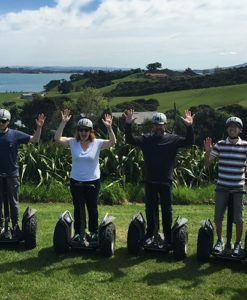 We zip along to the summit of Atawai Whenua Reserve which opens out to the magnificent Cable Bay Vineyard. 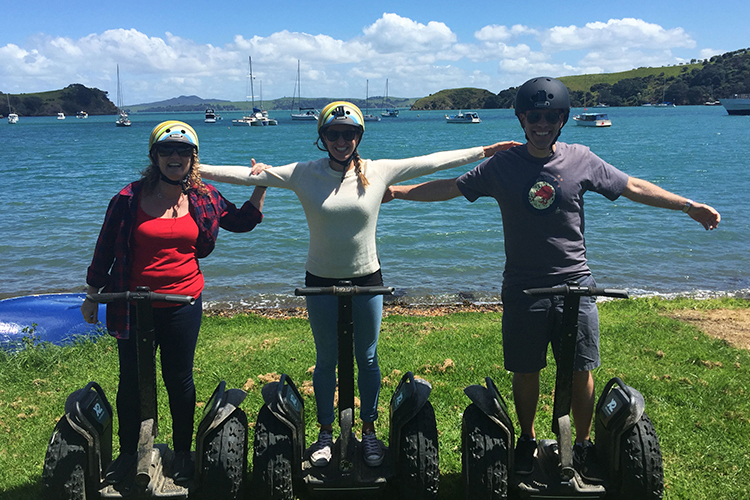 A few winding streets lead us to a rocky bay where we can test our ‘off road’ skills and skirt around the coastline, if the tides allow. 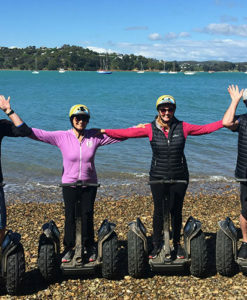 Here we may also catch a glimpse of some of the rarest birdlife in New Zealand, the Dotterels and unique Godwits (on Summer holiday from their home in Alaska). While we’re here we’ll check out the old Scow shipwreck ‘Rahiri’ (c.1907) and cruise past the Piritahi Marae (Māori people see their marae as tūrangawaewae – their place to stand and belong). 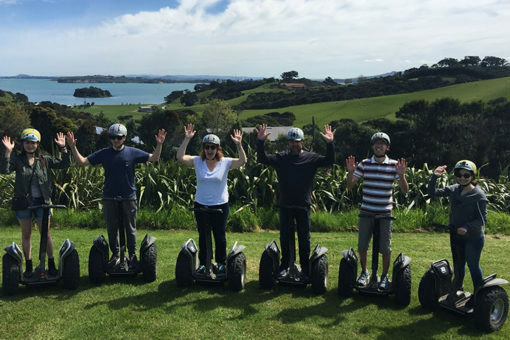 We will press on through the back of Oneroa town, riding past some amazing properties and incredible views looking across the Hauraki Gulf, back to Auckland and out to the South Pacific. 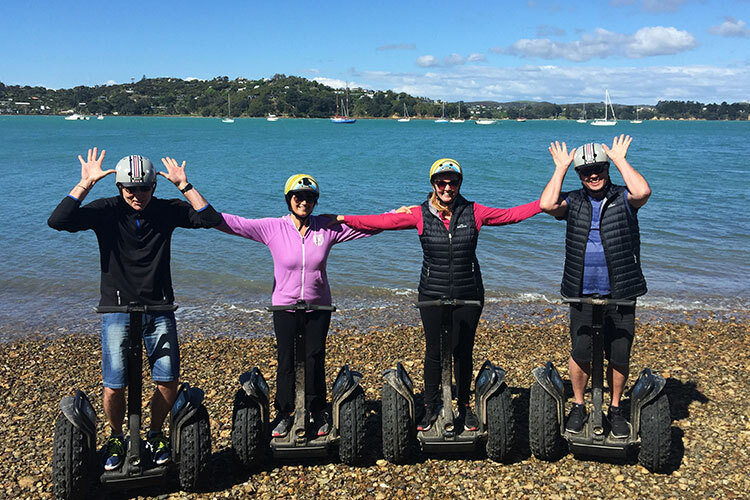 The beach is our next stop where you can take a stroll under the native pohutukawa (Christmas) trees that line the shore. 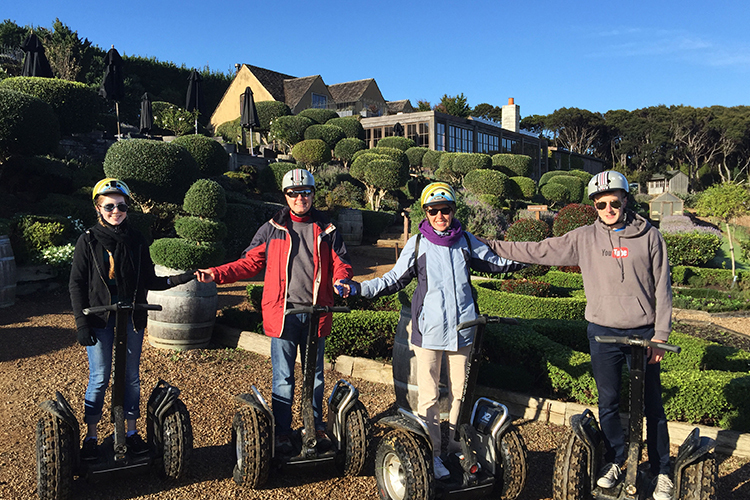 A few paparazzi shots and it’s time to retrace our steps a little back up to the Vineyards. 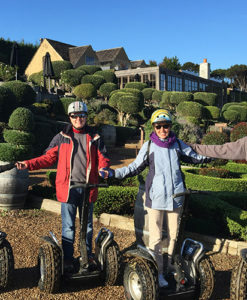 It’s a casual cruise round the hills to visit the romantic Mudbrick Vineyard. Renowned for their amazing food and striking views Mudbrick is a favourite with visitors to Waiheke, wine and food connoisseurs alike, as well as those who ‘tie the knot’ on the Island. Heading back we stop off at Cable Bay Vineyard where you can check out the menus (the wood fired pizzas are fantastic) or some of their hand-crafted wines. It also has one of the best views on the island so we can pause here for some Segway selfies and a group photo with the vineyard, gorgeous coastline, Auckland cityscape and ever-changing ocean in the background. 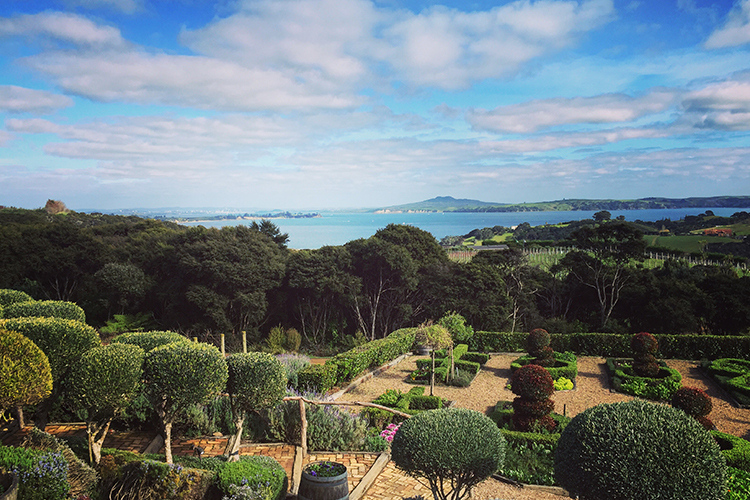 We can finish our Journey at Mudbrick or Cable Bay Vineyard, where you can relax and sample the amazing wines and food while soaking up some sun, or we will continue back down through the bush to our starting point at Matiatia Ferry Terminal ready for your next adventure. (please note: if you are thinking of staying for some lunch please email me to let me know, either in the notes section of the booking or after you have made your booking, and I can organise a reservation at either Cable Bay or Mudbrick for you). This was a fantastic experience. 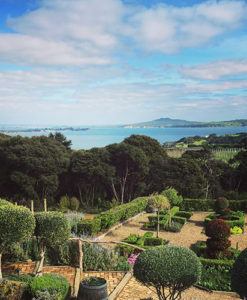 We got to see some really great views that I had never seen before of Waiheke. Defiantly one of the funnest things to do on the island. For anyone wanting to see the sights and have a great time while doing it, I would highly recommend giving this a go to anyone.